Staff trip recap to Piedras Blancas! Staff trips at Costa Rica Outward Bound are always something we look forward to. Our recent end-of-high-season trip to the Lopez household in Piedras Blancas was certainly a nice treat and followed a route many alumni will remember. Complete with a hike, visit to Rancho Tinamu, stop over at the Grenados household, fishing, river exploration and a good ol' fashioned cook out, a first-rate time was certainly had by all! So take a look at our trip recap and enjoy! Costa Rica Outward Bound staffer surfs himself into the news! The last in our series of quinoa recipes, we figured we would end it with some desert! Enjoy! 1. Boil quinoa in a rice cooker or saucepan with water until all water is absorbed (about 20 minutes). 2. Melt peanut butter and cinnamon together in small saucepan. 3. Mix peanut butter with fresh quinoa and add chopped banana and raisins to taste. You can also experiment with mangos, strawberries and nuts. Staff on Course: Rafting, Backpacking and Adventure Galore! Recently, marketing staff member Courtney Black went on course with this summer’s last 15-Day Multi-Element course! One of the perks of working for OB Costa Rica is the opportunity to enjoy some of the adventures that our students get to enjoy as staff! This particular course is renowned as our “adventure sampler pack” and includes everything from rafting and hiking to waterfall rappelling and surfing. Not exactly a seasoned outdoor enthusiast, Courtney was mildly apprehensive about the hiking portion of the course, but was still eager to break in her backpack for a trek that so many of her colleagues had raved about. The course began with a trip down the Class III Rio Sarapiquí. Both staff and students were pleased to have gorgeous weather and great whitewater. Students, Olivia and Andrew, manned the front of the raft and steered us effortlessly down the river (with help from Whitewater Coordinator Jody). The next day, the hiking portion of course began. One of the more challenging hikes of the course, the group left base camp to arrive at Brujo. From there, they hiked an impressive 15 km across streams and up mountains to arrive at the Lopez house in Piedras Blancas for a homestay. They made sugar from homegrown sugar cane, ground corn for tortillas and rappelled down the face of a waterfall. While the hike had its ups and downs (both literally and figuratively) it was well worth the trek. Orlando’s house is beautiful and overlooks a beautiful valley in Piedras Blancas. It is here the students had their “solos”, which is a time for students to reflect on their experience away from the group, where they spend their time camping under a tarp, with only pen and paper and their thoughts. For Courtney, this time meant avoiding the rain, as she missed an important lecture in knot tying and tarp securing. Next stop: Hernand’s home, which overlooks the banks of the Rio Savegre. There we baked homemade bread and learned about “Tico” culture. 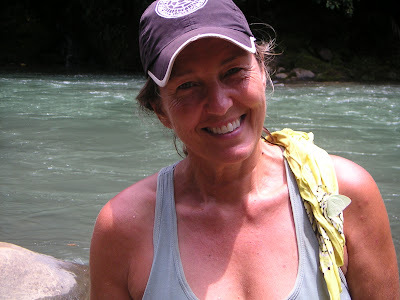 Interesting fact: The Rio Savegre is one of the top two cleanest rivers in Central America. Exactly a week in on course, the group hiked Rancho Tinamú (6 km). It was a steep hike, but the view along the way was beyond incredible. Upon arrival, the group took a swim in La Olla de Bruja, or “the witch’s pot” which is a swimming hole underneath a waterfall about 1 km from the lodge. The afternoon was spent procuring our dinner in the form of a ceremonial chicken kill. This exercise is intended to encourage students to consider where their food comes from. A former vegetarian of ten years, Courtney was less than enthused to wield the machete, but did appreciate the lesson taught (and will now reconsider her omnivore practices). 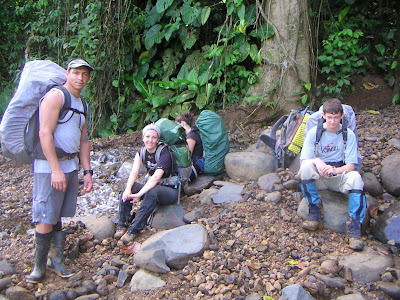 On the final day, the group hiked 18 km from San Isidro de Dota to Londres de Quepos. It was a doozie, but the group survived and handled it like champs! Promises of ice cream at the destination is always good incentive! Total miles hiked: 30. Weight of packs: 30-40 lbs. Confidence boosts: Immeasurable. At this point, Courtney returned to base to go back to the “real world” and her job in the marketing office, but the rest of the group went on to do a service project at Manuel Antonio, surf, and have one more go at rafting, this time on the Rio Pacuare. Donna always with a smile! Head lamps are in many respects one of the most important pieces of equipment when embarking on an outdoor expedition. Their practicality and necessity are immediately realized when you don’t have one, and when you do, the night no longer inhibits your every move. Cooking, eating, packing, playing cards, and doing basically anything that involves two hands without having to carry a flashlight, is made easily possible. Due to the fact that Costa Rica’s sun leaves the sky at about 6:00 pm, there’s still a lot of day left that requires some good light. The reasons are bright and clear – head lamps are good! One headlamp at this year’s Summer Market which spiked interest was Snow Peak’s Snow Miner, which takes its simple and clean mantra into the head lamp arena. The Snow Miner is a basic lamp that boasts 140 hours of battery life on low and 55 hours on high, and it is water resistant (which is certainly good for wet conditions in Costa Rica). It weighs 87 grams/2.9 ounces, which is light enough so that it won’t be noticed, until you need it! Once you use head lamps, you know how important they are! 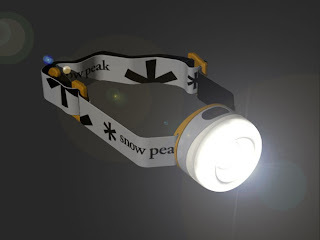 Now with any luck, the folks at Snow Peak read this and send one for us to test! We recently spoke of some tasty and healthy recipes from our very own health food aficionado, Monica Chen. This installation of recipes for Quinoa will be sure to please, as it certainly does here on the Costa Rica Outward Bound base. Having spent many months in the region of South America where Quinoa comes from, Monica is well versed on this versatile food and is always happy to share a recipe. Here is one recipe that was enjoyed by the folks here at Costa Rica Outward Bound! 1. Preheat the oven to 400 degrees F. Spread the vegetables onto a baking sheet. 2. Mix together the soy sauce, vinegar, oil, garlic, sugar and pepper in a small bowl and drizzle evenly over the vegetables, coating as many as possible. 3. Cook the vegetables for about 1/2 hour-45 minutes, or until they are a light golden brown and a little crispy on the edges. 4. Meanwhile, bring vegetable stock to a boil. Stir in the quinoa, turn down the heat and cook at a light simmer for 20-25 minutes. 5. Once the vegetables and quinoa are done, gradually fold the vegetables together with the quinoa in a large bowl. 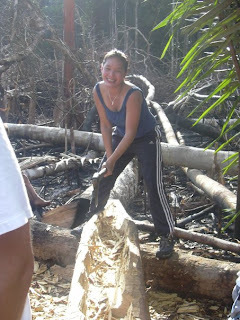 Monica digging out a log in South America, but we all know she's thinking about Quinoa! 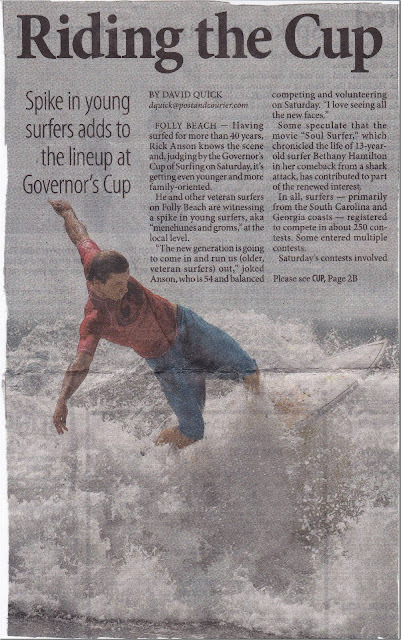 Outward Bound intern makes the paper! 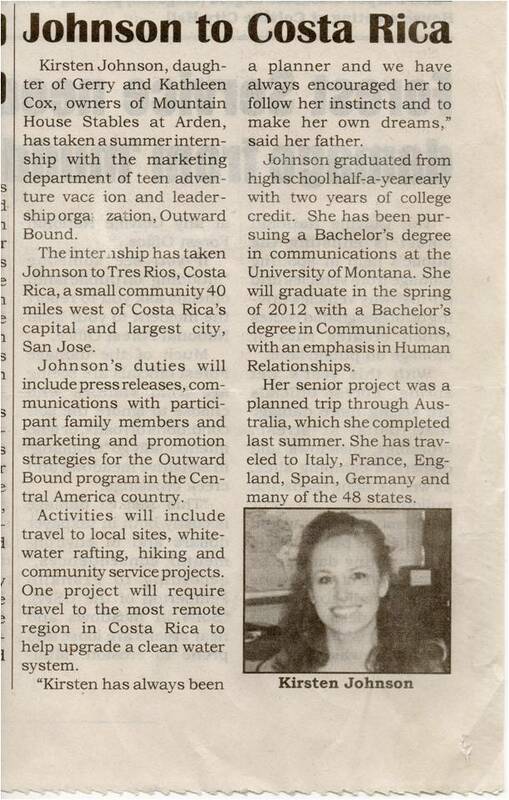 Costa Rica Outward Bound has been fortunate to have some great people working for a great cause. Our recent marketing intern Kirsten was certainly part of that fantastic team. Many of the students will remember Kirsten, who worked hard to manage the arrival and departure for most of the summer courses. Kirsten hails from Alaska but currently attends school at the University of Montana pursing her degree in communications. 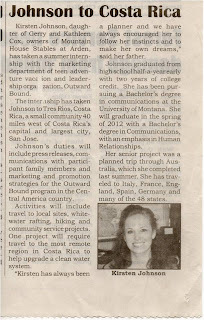 No stranger to the difficult demands of the fast paced working environment at Costa Rica Outward Bound, Kirsten was responsible for numerous press releases written to the local papers of many students this summer. It is fitting that she would thus pop up in her own local paper, take a look! If you are interested in becoming an intern at Costa Rica Outward Bound, take a look at our employment page here. We’re always looking for a hard worker who doesn’t mind the occasional bug bite!